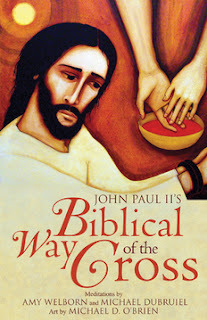 You can get John Paul II's Biblical Way of the Cross here. In 1991, Pope John Paul II introduced a new Bible-based interpretation of the Stations of the Cross. This devotional guide invites readers to prayerfully walk in solidarity with Jesus on his agonizing way of the cross—from his last torturous moments in the Garden of Gethsemane to his death and burial. Now with full-color station images from previously unpublished paintings by Michael O'Brien, this booklet creates an ideal resource for individual or group devotional use, particularly during the Lenten season. How to "Offer it Up"
What Road Will You Choose?